Place applicator at upper end of test panel. Pour coating directly in front of the knife-blade. Draw applicator toward lower end of panel at an approximate uniform rate of 10 to 12 inches (250-300mm) per second. Clean applicator immediately after use and thoroughly dry the blade. Caution: Do not wet or submerse micrometer heads. Mil Measurement - Used on the Imperial Microm film applicator, each graduation on the Thimble Scale equals 0.001 in. = 1mil. The first visible number is 1 which is 0.001 in. = 1 mil, the second number is 2 which is 0.002 in. = 2 mils, etc. One complete revolution is 25 graduations = 0.025 in. = 25 mils. The first increment on the Sleeve Scale = 0.025 in. = 25 mils, the second increment on the Sleeve Scale = 0.050 in. = 50 mils, the third increment on the sleeve = 0.075 in. = 75 mils, etc. Micron Measurement - Used on the Metric Microm film applicator, each graduation on the Thimble Scale is 0.01 mm, the first visible number is 5 which is 5 graduations = 0.05 mm = 50 microns. One complete revolution is 50 graduations which is 0.50mm = 500 microns. The first increment on the Sleeve Scale is .50 mm = 500 micron, the second increment on the Sleeve Scale is 1 mm = 1000 microns, etc. Cautionary Note: Make sure that there is no foreign matter such as iron fillings adhering to the blade magnets as this might result in improper applicator calibration. Before use, check the zero settings of the micrometers. Place applicator on a polished granite flat plate or alternatively plate-glass of suitable size. Set micrometers at zero. The blade should touch the glass/granite flat plate from end to end without the side plate being elevated. When the applicator is placed between the observer and a bright back light the user should see no light from beneath the blade and side plates. The zero point should check within ± 0.0005". If not adjustment is required, place slight but constant pressure on the top support rods of the applicator with one hand. Rotate the micrometers so the blade is seated on the granite flat plate evenly from end to end and ensure no light is observed. Loosen the set screw on the top of the thimble on the micrometer, this will release the top thimble from the spindle. Align the zero mark on the thimble with the zero mark on the micrometer barrel and secure the set screw. Repeat if necessary to assure a proper zero is achieved. 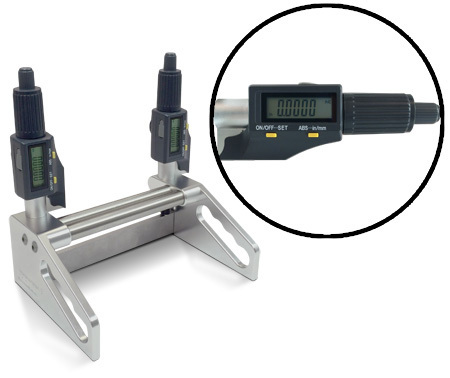 Before use, check the zero settings of the micrometers. Place applicator on a polished granite flat plate or alternatively plate-glass of suitable size. Set micrometers at zero. The blade should touch the glass/granite flat plate from end to end without the side plate being elevated. When the applicator is placed between the observer and a bright back light the user should see no light from beneath the blade and side plates. The zero point should check within ± 0.0005". 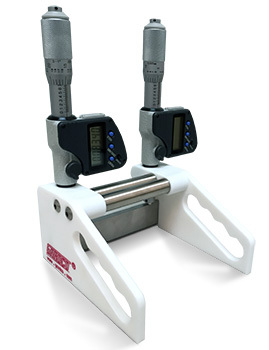 If not press the Zero button on the digital micrometer to reset the reading to zero. Repeat if necessary to assure a proper zero is achieved. For information on laying down wet films of coating materials refer to ASTM Specification D823, Producing Films of Uniform Thickness of Paint, Varnish, Lacquer and Related Products on Test Panels. A finely machined SS knife-blade fitted into slots in the end section allows vertical adjustment of the blade. Two finely-made micrometer barrels that can be easily set so that gate clearances can be adjusted from 0-0.250" in increments of 1 mil (.001") w/resolution to 1/2 mil (.0005"). Thimbles & barrels of the micrometers are dull chrome. A special clear anodized aluminum frame with 2 end sections that provide a large paint well. 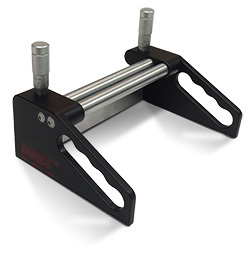 The end sections also serve as ergonomic operator hand grips when drawing down wet films. 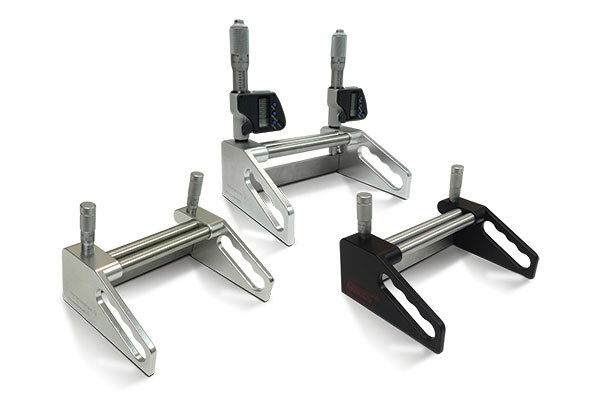 Replacement blades are easy to install & calibrate. The entire side plates are Teflon® coated, this makes it ideal for fast clean up (non-stick) and has one of the lowest coefficients of friction against any solid also Teflon® is very non-reactive. These types of applicators are also used for casting films on thin substrates, the Teflon® coating helps prevent tearing of the substrate by minimizing friction with the substrate. The solid Teflon side plate Microm II Applicator (PT Series) has an added dimension of being manufactured out of Solid Teflon giving it the ultimate in non-stick and the lowest coefficient of friction available. This type of applicator prevents tearing of especially thin substrates with the minimum amount of friction to the substrate. 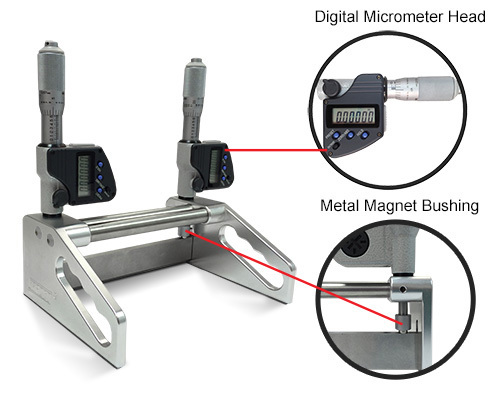 Shown with Optional Digital Micrometer Head. Spindle lock to hold measurements in place. 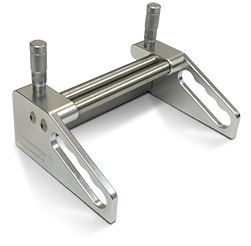 This optional locking mechanism is for mechanical micrometers. You can now purchase any Microm Film applicator with a PTFE coated blade. The blade is coated with a tough, durable PTFE film that provides excellent non-stick properties which makes for easy cleaning and good corrosion resistance. It also makes the blade more durable with exceptionally good abrasion resistance. Microm II item numbers below. Equivalent metric versions of all of the above models are available. A 6-inch applicator for example, would become a 15.2cm path width blade, adjusting 0.01mm increments to 6.35mm maximum opening.